The truth is always stranger and usually more funny than fiction. Unfortunately it is often sadder too. Sad to see what the church is willing to fall for. Sad to see Christians line up to be fed poison. Line up to have their itching ears scratched at any cost. The world sometimes seems far more discerning than the church. Not of spiritual matters but in general. Do you think anyone would line up to see Donald Trump give a conference on the evils of Twitter or how to love everyone? How about Hillary Clinton running a conference on email security (props to Chris Rosebrough)? Or Keith Richards of the Rolling Stones telling kids to not do drugs. Or Madonna preaching celibacy. It would simply be laughable and no one would pay it any mind. But not in the church. The Christian Post is reporting that disgraced former pastor, Mark Driscoll will be hosting a conference this November on how to build a healthy church. Yes, that Mark Driscoll. The same one who just destroyed his own church a scant few years ago. The man whose church was so unhealthy there are still support groups all over cyberspace for the wounded victims of Mars Hill Church. One of the primary speakers listed is Robert Morris of Gateway Church. Yes, that Robert Morris. The same guy who threatens his sheep that if they do not give him the first 10% of their money that God will curse all of it. The same mega church vision casting fraud who follows the word faith heresy to the hilt. Who beats his sheep routinely. This is one of the keynote speaks at a conference on building healthy churches? Seriously? It is not surprising since Morris befriended Driscoll when his church imploded from the weight of his own corruption. It was Morris who allowed Driscoll to preach at his church when he had no church. So, no quid pro quo here, just move along. "Yesterday we fired two elders for the first time in the history of Mars Hill. They were off mission, so now they're unemployed. This will be the defining issue as to whether or not you succeed or fail. I've read enough of the New Testament to know that occasionally Paul [the Apostle] puts somebody in the wood chipper." Still not satisfied, he then put the two on trial for their memberships and encouraged his congregation to publicly shun one of the men, Paul Petry. Not just shun him, but his entire family as well. When another Elder emailed asking for fair trials for the two men, Driscoll encouraged his congregation to stop giving to that man's charitable organization, causing and 80% drop in revenue for him. Yes, Mark Driscoll knows a whole lot about building a healthy church government. That is if you are seeking to build an autocratic government that is willfully spiteful and seeks to crush your enemies. You know, as the ole Wood Chipper Paul used to. 1) Mark Driscoll used a marketing company to cheat the New York Times Best Seller list so he could claim he was a NY Time best seller when he most certainly was not. While this would be reprehensible enough, he stole $200,000 in tithe monies to pay the marketing company. This is not in dispute. Driscoll simply claims that his board, which he already bought and sold, approved the usage of the funds. As if that matters to God at all. 2) Mark Driscoll has been accused of plagiarizing every single book he has ever written. While you may wonder why I would list this with finances remember that this is also theft beloved. It is theft of intellectual property and pretending it is your own. Why would anyone want to listen to a man who steals so readily about raising and managing church finances? 3) Mark Driscoll currently has a racketeering lawsuit filed against him by former Mars Hill Church members. The RICO lawsuit alleges that Driscoll ran the Church like a crime syndicate. Included in the charges are mail and wire fraud. Driscoll is charged with raising additional offerings for an International Global Fund that never left the four walls of the church. The lawsuit also demands transparency for the recent dissolution of Mars Hill and who the money went to. Yet Driscoll thinks that people should come listen to him about how to properly raise and manage church finances? Why not have Joel Osteen speak on the importance of sound hermeneutics while you are at it? Creflo Dollar, Joyce Meyer, and Mike Murdock can moderate a panel on never preaching for shameful gain. Unreal. To Mark Driscoll the people who would dare question him are either terminated, shunned or blessedly subtracted. He views them all as a pile of dead bodies that he leaves in the wake of his demonic-led vision. He is a fugitive from church discipline, as he resigned to avoid being officially reprimanded and disciplined. He claimed that God spoke to him audibly to leave because the elders, whom he handpicked, were "laying a trap" for him. He is a liar and a charlatan of the highest order. He is utterly disqualified from ministry beloved. Our prayer is that he comes to penitent faith in Jesus Christ for the forgiveness of his many sins against God and His bride. The key verse today is one of many describing false teachers such as Mark Driscoll. He does not serve our Lord Christ. He serves only his own appetite. He is a smooth talker who deceives the hearts of the naïve. 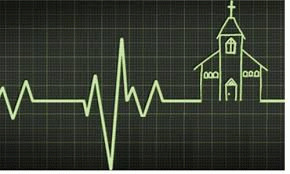 With this record, which is not even all-inclusive, he thinks he should host a conference on building healthy churches. Absolutely shameless.